When considering process improvements, it is necessary to understand a concept from the Theory of Constraints. This is the concept of Flow Modules as presented by Robert E. Fox (Co-author of The Race with Eli Goldratt). These modules comprise the major sections of all high level process networks whether the network involves problem-solving processes, information management processes, physical production processes, or any combination of these types. There are four modules and they are labeled by their shape. Fortunately, they look like the capital letters A, V, I & T. In all cases, “Flow” starts at the bottom of the letter and proceeds toward the top of the letter. Picture an assembly plant. You have short sequences of process steps coming along that feed other, larger sequences of process steps in an overall flow that looks like a capital A. When they arrive at the end process, or the apex of the A, they are all assembled and can go to the customer. This is the most common type of process network. This occurs when there is a resource that is very expensive such as a piece of capital equipment, an expensive human resource such as an attorney, or an expensive land resource such as downtown Chicago. It also occurs when their is a resource that is in short or very short supply due to some outside constraint such as a legal or environmental requirement or a safety issue or even (and THIS is a can of worms) an internal political power issue. You can produce any number of things with that resource, but all of the things that happen after that resource are limited by what can go through the original resource which is in short or very short supply. Other examples of this are automatic molders at the beginning of a door shop, or aluminum extrusion presses at the beginning of an aluminum extrusion business. This flow pattern is just a straight through one-thing-right-after-another process. It looks like a capital “I”: a whole bunch of processes that run sequentially right after each other and they are dependent upon each other for delivery, quality and reliability. Another name for this structure is a First-In-First-Out (FIFO) chain. The “chain” part suggests the presence of stacked, sequential statistical dependencies. This module is characterized by an “I” module with the last operation at the top of the “I” feeding a whole bunch of co-equal outputs. An example of this is a ball bearing production facility where the bearings can go to either motors or to car wheels or to any number of mechanical devices. Another example of a “T” network occurs when you encounter a system where “half of the things we deliver are late.” This situation probably means that one or more common things are happening. Perhaps scheduling is expediting things from the top of the “I” process to whoever screams the loudest among the coequal outputs or “Ts”. For example, if the last process at the top of the “I” is a paint booth, then the orders that are painted red get delivered before the orders that are painted purple, because the sales rep for the red product screams louder than the sales rep for the purple product. It does not mean that the paint booth has any greater capacity. It does not even mean that the paint booth is necessarily behind in “average” (an “oops” word in CPI circles meaning you do not know precisely what is happening in a critical process or process step) production. It just means that the expediter for the red product is more effective that the expediter for the purple product. It may also mean that specific setup times are too long… or way too long so that “average” production rates mean you just are not getting what you need when you need it because it’s not “efficient” to change that process over to run small, expedited, orders. If this sounds all too familiar, please see Quick Changeovers for Operators: the S. M. E. D. System reference in the Client Suggested Reading Library. There is a modification to this module where multiple “A” networks, as well as multiple “I” networks feed into an assembled-to-order-inventory. Consider the process of the periodic maintenance of a military aircraft. The aircraft shows up for periodic maintenance at the service depot and is summarily stripped of all of its parts and components down to the engines and the wheel bearings. This is a “V” network in that the airplane arrives and is summarily divvied out into its component parts. Next you have a whole bunch of simultaneous “I” networks, where everything from the frame components to the electronics to the control surfaces to the engine components, etc. are cleaned and serviced or replaced. Each of these “I” networks can even be an “A” network if new parts or supplies are required to process these parts. Next you have an “A” network where all of the components that have been serviced or replaced are reassembled and tested. The curious thing to note about this sort of network is that the last elements of the initial “V”, the inside most components of the various subsystems within the aircraft, are the first things that are needed to go into the final “A” network. Thus, you may properly suspect that “flow” is truly needed along these particular critical paths. The “control points” for each of these networks are fairly straightforward. 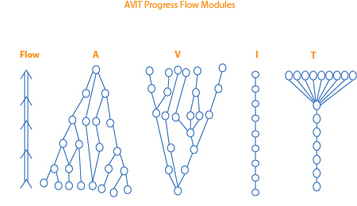 You control and “A” network with a visual, or Kanban Inventory just prior to the apex. 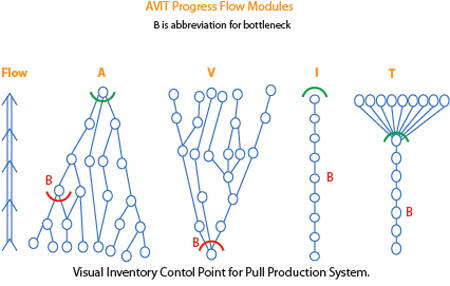 You control a “V” network just after the apex by specifying the proportion and schedule of specific outputs it produces to control all of its downstream outputs. You control an “I” network just after the last element at the top of the “I” – also with a Kanban inventory. You control a “T” network (or a combination of “A” and “I”, networks that feed into a “T” network) right before it splits out into the T also with a Kanban inventory.